Good views from the track across the moor but only suitable for 4x4 vehicles. RATING: Not an easy lane. 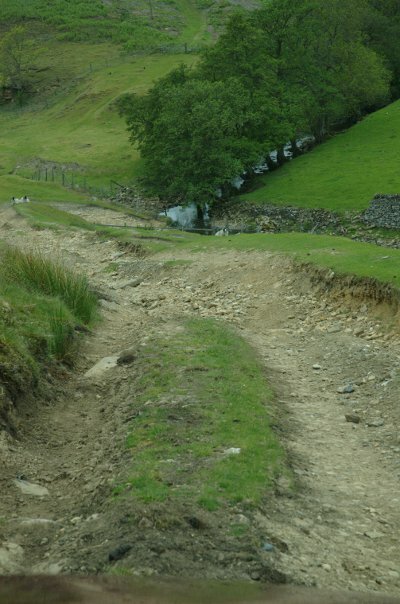 Difficult and uneven descent down to the ford. 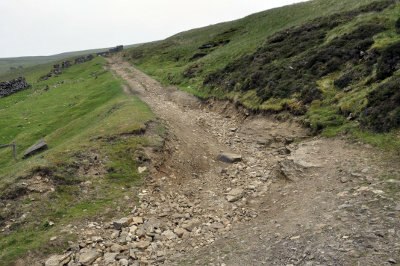 The description said 'quite technical towards the end' and 'needs careful driving to pick the safest route'. 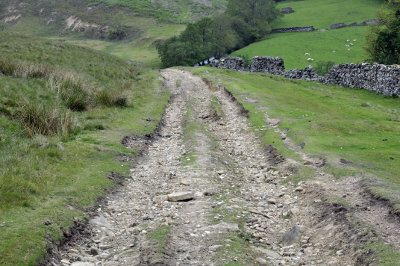 So we set off to drive it thinking it sounded like it might be just a little tougher than other Yorkshire Dales lanes. 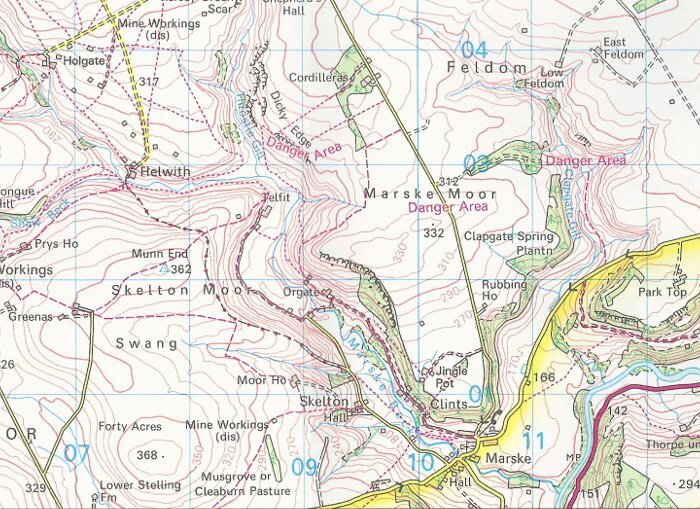 It took a bit of finding even with the Landranger map and co-ordinates to refer to as although Marske is a small village there seems to be a lot of roads to choose from. 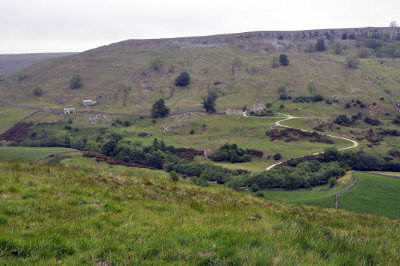 Eventually we worked out which was the correct one and we headed away from the tarmac up a fairly steep and rocky wall lined track towards Skelton Moor. Once at the top you are on an easy grassy track running across the fields and the views over Clints Edge and towards Orgate are breathtaking. 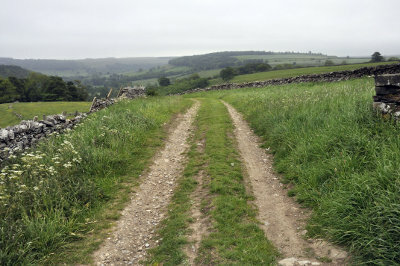 It was June 2011 and the day was fairly dull and a little misty but we spent a while enjoying the scenery before continuing our journey over the moor. 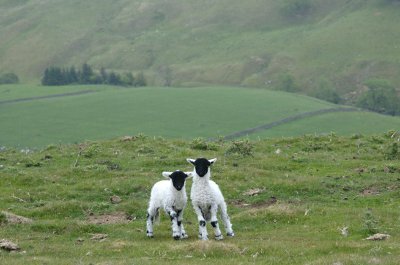 All thoughts of the 'technical descent' forgotten we enjoyed the drive, smiling at a couple of lambs that seemed quite surprised to see us up there. We're always told to get out and walk the lanes if in any doubt but unaware of what lay ahead we started the descent towards the ford. The deterioration was immediate. One minute we were on a perfectly decent track and then round the corner we found ourselves at a frightening angle with no chance of turning back and the track in front of us was a complete washout. Low box hastily engaged we started moving forward again slowly. I remember reading somewhere about exactly what angle a Land Rover could safely recover from and I felt we came close to those angles. Great for those driving the lane in a sturdy Defender but the Disco needs to be back on tarmac ready for the weekly commute by Monday morning! I offered to get out and guide the drive but it was decided that I was more use weighting down the passenger side. I have to apologise for the lack of photographs to illustrate just how bad the road was but to be honest photography wasn't uppermost in my mind at this point - working out the line needed to arrive at the bottom in one piece became pretty important for the next half an hour. Very many times I have wished we'd have had the grill mounted video camera running. 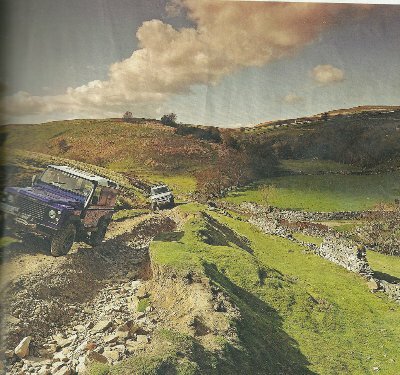 At risk of infringing copyright I have included at the bottom of this page a photograph taken from 'Landrover Owner International' magazine (June Issue 7 2011) showing their drive up the same section of the track. And so we made our way down slowly and carefully, alternating between the left and right hand ruts and avoiding grinding difs and other lower slung areas on the higher ground between. 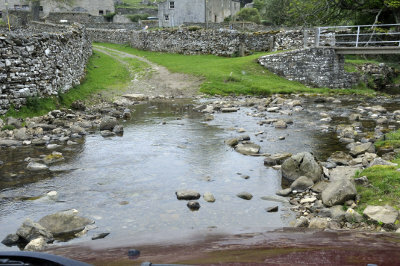 We rounded the tight hairpin bend at the bottom and splashed across the ford surprisingly unscathed with a certain sense of achievement and more than a little relief.